For the second year, Geraldine’s will be hosting Red, White and Blues in honor of Independence Day. Come by the restaurant on Monday, July 3 at 7:30 p.m. for some specialty bites and cocktails that really embody the essence of ‘Murica! Be sure to stick around for some great tunes performed by Akina Adderley and The Vintage Playboys throughout the evening. 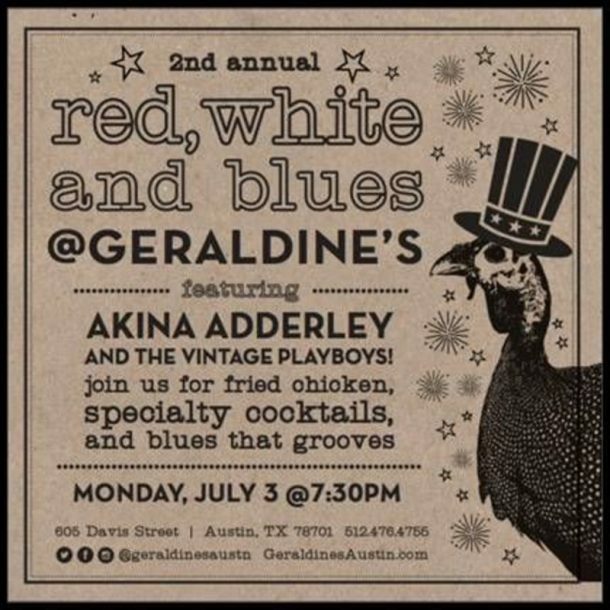 This is a not-to-be-missed event, so be sure to make reservations by calling 512-476-4755 or visit www.geraldineaustin.com. Nicknamed “the little woman with the big voice,” vocalist, songwriter, and bandleader Akina Adderley was born into music; it is etched into her like the tattoo of a family crest. You could say that her father, Nat Adderley, Jr. (jazz pianist and former bandleader for Luther Vandross), grandfather and granduncle (renowned jazz musicians Nat Adderley and Julian “Cannonball” Adderley) planted the seed of song in her soul, yet her sound and style are completely her own. Her music crosses genre boundaries effortlessly; depending on the song or the set or the day, she may make you get up and dance or sit down and cry; she may rock you with funk and soul or cloak you in jazz-infused R&B. Either way, you will be moved by what the Austin American Statesman calls her “rich, emotive pipes” and impacted by her songs with their infectious grooves and incisive lyrics. From New York City, Akina’s studies took her from LaGuardia High School of Music, Art, & the Performing Arts (The “Fame” School) as a drama major, to the Manhattan School of Music’s Prep Division as a classical voice major, to Yale University, and back to New York to Mannes School of Music and The New School. During a stint in LA, Akina finally began to perform professionally, singing backing vocals for local bands. Akina found a home in the rich music scene of Austin, with its collaborative spirit and world-class musicians Since moving to Austin, Akina has shared bills with the likes of Bob Schneider, Gary Clark, Jr., Alejandro Escovedo, Pinetop Perkins, Carolyn Wonderland, Booker T, Budos Band, and Big Sam’s Funky Nation, and she has sung backing vocals on the albums of Charlie Mars and Gregg Rolie (of Santana and Journey). Akina has performed all over Austin at venues as massive as ACL Live and Stubb’s and as intimate as Cactus Cafe, and has been equally comfortable sharing a set at a little landmark club and busting out a ferociously vibrant show in front of a crowd of thousands. Akina has made Austin her musical home, but she has taken her music all over Texas and to Los Angeles, New York, Memphis, Nashville, Columbus, Tuscaloosa, and Hattiesburg. She has produced two albums and toured extensively with her 9-piece soul band, Akina Adderley & The Vintage Playboys. She is currently revving up with an exciting new soul/jazz quintet, Akina Adderley and the Upper East Side, and most recently, she released a gorgeous new album—World Anew—with jazz/folk/world group, Nori. You may also catch her backing up Nakia or in Charlie Faye & the Fayettes. Akina overflows with a passion for music, so it’s no surprise that she doesn’t stop at performing and writing. In addition to being a musician, Akina counts Educator as one of her titles. She strives to foster and regenerate this passion in others as teacher and Music Director at Griffin School, instructor and band coach at Girls Rock Camp, conductor for the Santa Barbara Youth Ensemble Theatre and Adderley Repertory Theatre Ensemble, and private voice instructor.